By the end of 2010, motorists will be able to drive from Cork to Dublin on motorway roads. When the National Roads Authority came to plan the route of a section of the new motorway between Cashel, Co. Tipperary, and Mitchelstown, Co. Cork, the archaeological impact of the new road was evaluated. The route chosen by the engineers crossed the River Suir to the west of Cahir and followed the southern slopes of the Galtee mountains. The new road passed through rich farmland and upland pastures that have been inhabited by our ancestors for at least six millennia. The archaeological investigations in advance of the construction of the N8 Cashel–Mitchelstown Road Improvement Scheme, identified 58 previously unrecorded sites which ranged in date from the Early Neolithic period (4000–3600 BC) up to the post-medieval period (AD 1550–present); the majority of sites (41) produced evidence of Bronze Age activity. The road scheme, which opened in July 2008, comprises 41km of improved dual carriageway from Cashel, Co. Tipperary, to Carrigane, Co. Cork (just north of Mitchelstown). Following a geophysical survey and a programme of archaeological testing along the route of the road in 2005, excavations were carried out during 2006 and 2007 by Margaret Gowen & Co. Ltd. 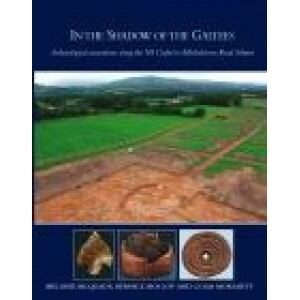 In the shadow of the Galtees describes the results of these excavations, which have unearthed settlement, ritual and industrial evidence spanning millennia. In particular, these investigations have afforded an opportunity to examine the changing character of late prehistoric settlement sites. Much of the excavated evidence serves to illustrate the ideological centrality of the home in Bronze Age society, suggesting that economic, political and ritual activities were not divorced from the domestic domain as they are in our own time. Nonetheless, the excavations also revealed that the use of the landscape was subject to division and it would seem that in this part of Munster burial activity and the use of burnt mounds took place at a distance from contemporary settlements. Publication Data Published October 2009, paperback, 328pp, 170 figures and plates.